For cyclists avoiding wet and snowy road conditions, indoor virtual riding app Zwift has launched for Apple TV 4 and Apple TV 4K. The Zwift tvOS app allows riders to ride open roads, do structured workouts and join races, plus also partake in social group rides, all in real-time. 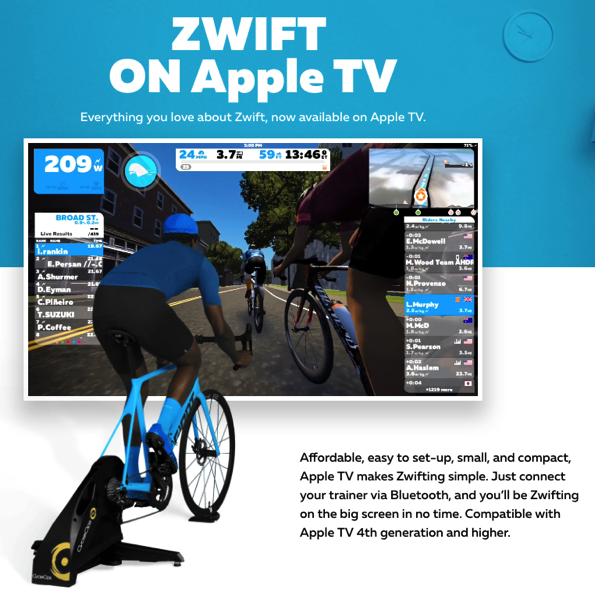 To get started on Zwift for Apple TV, you’ll need your bike on a trainer and the Zwift mobile app. Note your ANT+ speedometer and cadence sensors won’t work with Apple TV 4 or 4K, since the latter only supports Bluetooth. Users can also pair their Apple Watch to Zwift, to utilize heart rate data from the smart watch to show in the game. Zwift comes with a free 7 day trial, then it’s $14.99 USD per month. The game recently saw a $5 USD price increase which some loyal customers did not appreciate, as shared by their thoughts on social media.